As much fun as zip wires are, safety, especially with young children must be first and foremost. The difficulty with safety and young children is that they are continually growing and in most cases will not have developed any hips yet which are needed if wearing a seat harness. 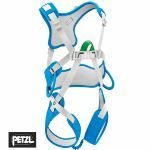 For this reason we offer a small number of fully adjustable full body harnesses which are much better suited children to use. These young children's harnesses are suitable for children from the ages of 4 to 10years old approx and under 40 kgs in weight. 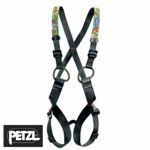 They are fully adjustable on body length from 35 - 60cms and one of the harnesses also has adjustable leg loops.